It is so easy to post about the things we create when they work out. But what about the crafts that don't make the blog cut? Where do they go? We don't usually speak of those ones. I thought it would be fun to make a post of one of our crafts that didn't go so well and thus my craft blooper. 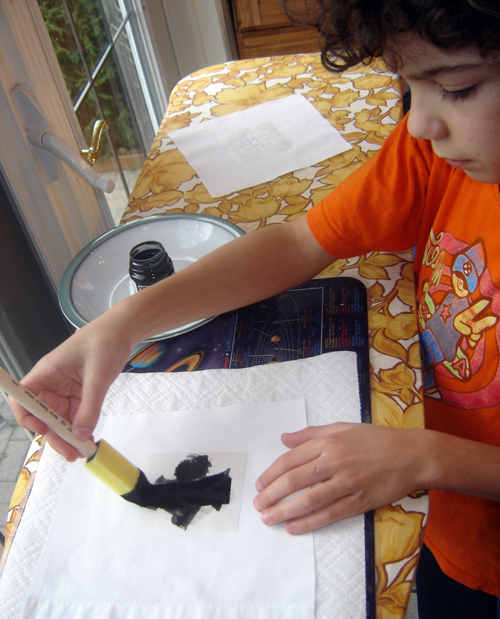 We set out yesterday to try our hand at freezer paper stenciling. It's a great way to custom decorate up just about any piece of fabric in your wardrobe. It also works for gifts and the possibilities are pretty endless. When my mum was in the US last month I had her bring me back a roll of reynolds freezer paper, which is not available here. I explained the details to my two ambitious crafters and the boys set out to create a picture that we were going to transfer to the freezer paper. 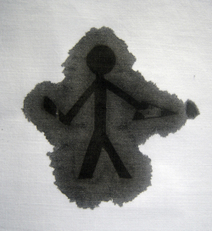 Once done the initial drawing, they transfered it to freezer paper and then ever so carefully cut it out. A butterfly and a stick man holding a piece of cheese. Next step is the painting. Oh but wait this is where I notice a problem. I noticed that there is a whole lot of bleeding through that shouldn't be happening. You can see for yourself what I'm talking about. At this point I took off the freezer paper because it was so obvious that something was not right. Definitely not the look we were going for, though the boys still think they look cool. After I figured out where we went wrong (I forgot to iron freezer paper to the back side to prevent bleeding). We tried it again. This time it had the same result *argh* only to realize I was using the wrong paint. Duh?! There you go, not all crafts end up working out as planned. But I though it was a great teaching moment so I told the boys: "well guys, we've figured out two ways not to do freezer paper stenciling" and mister J responded "keep moving forward". As for today we are heading out to our local art emporium to buy the right paint medium and later we will give it another whirl. Perseverance must prevail (either that or I have to save face). 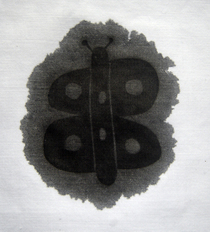 In the meantime if you want to see some fantastic freezer paper stenciling (done correctly), check out the flickr photos here They are inspirational. Wow, I didn't realize how long its been! Man that's insane. Anyway, I appreciate your craft blooper! It lets me know that you Martha Stewart types are still human. LOL As for the lovely socks you knitted (shown several blogs ago) are really great. Made me think of darning, which made me think of holey socks, which made me think of my solution to worn out socks. I use them as dusters (turning them inside out works great!) So I'm rambling what can I say LOL. Karla, that's a good way to recycle the sock! When the hubby has holes in his big fluffy socks, I usually roll one sock up into a ball and put it in the other sock, tie a big knot with the length and voila a new dog toy to pull on and rip apart!